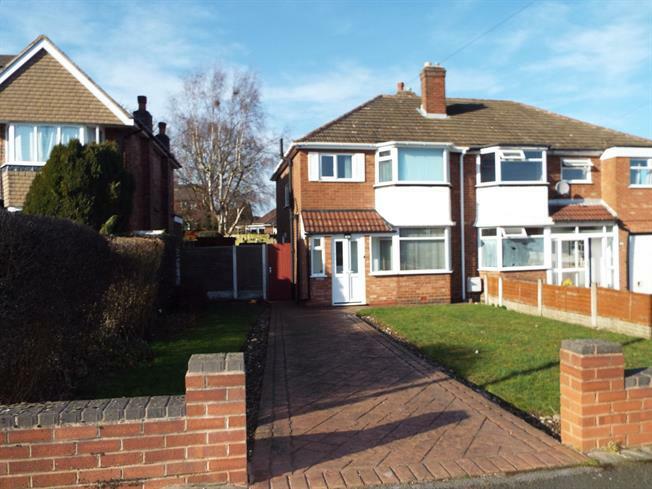 3 Bedroom Semi Detached House For Sale in Sutton Coldfield for Offers Over £200,000. A well maintained and well presented semi-detached house, in need of modernisation but benefitting from double glazing. The accommodation in brief comprises: entrance hallway, lounge, living room, kitchen, three bedrooms, family bathroom. Externally the property benefits from a walled driveway and front rear and side gardens, side. Internal viewing is highly recommended to fully appreciate the size and potential of accommodation on offer. Double glazed bay window facing the front. Electric heater, ceiling light. Double glazed, sliding patio door opening onto the garden . Electric fire, ceiling light. Double glazed window facing the rear, double glazed door to side. Roll top work surface, fitted base and drawer units, single sink with drainer, space for oven, space for fridge/freezer. Double glazed bay window facing the front. Fitted wardrobes, ceiling light. Double glazed window facing the front. Fitted wardrobes, ceiling light. Double glazed window facing the rear. Ceiling light. Double glazed window facing the front, airing cupboard. Low level WC, bath, wall-mounted sink. Patio area, lawn, side area and path, brick built outhouse, timber shed, side access, fenced surround.